In the first activity, construct a plane that passes through points A, B, and D. definitions/distinctions: Parallel and skew lines share the characteristic that they both are pair of lines that do not intersect. The difference is that parallel lines do not intersect and are contained on the same plane. 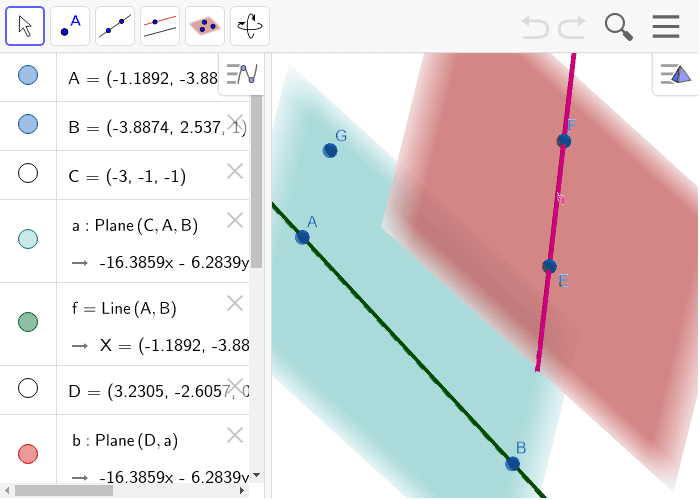 Skew lines do not intersect but cannot be contained on the same plane. Does the plane you created contain points A, B, D, and E? What can we conclude about lines AB and DE since they are contained on this new plane? Lines AB and DE are perpendicular. Lines AB and DE are skew. Lines AB and DE are parallel. Construct a line parallel to line AB through point F. Drag the diagram around to see all three lines parallel to each other. In the second activity, construct a plane that passes through points A, B, and E.
Does the plane you created contain all the points A, B, E, and F? What can we conclude about lines AB and FE since they are not contained on this new plane? Construct line GF. See the relationship between the three lines. 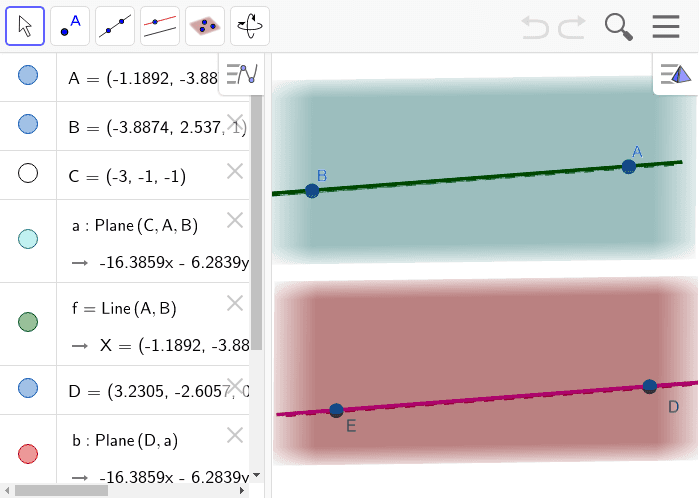 It may be helpful to hide the plane you created to see the skew lines.